While there are those who would agree along with the Boston Herald that "when arguments about the greatest living quartet begin, one choice remains non-controversial: the Emerson Quartet," there are those who might amend their assertion to read "the greatest living American quartet. Because while it might be persuasively asserted that there are European quartets the Emerson's equals and perhaps even their superiors -- the Alban Berg and the Hagen Quartet come immediately to mind -- it would be hard to argue that there's another American quartet that comes close to the combination of qualities that make the Emerson so successful. 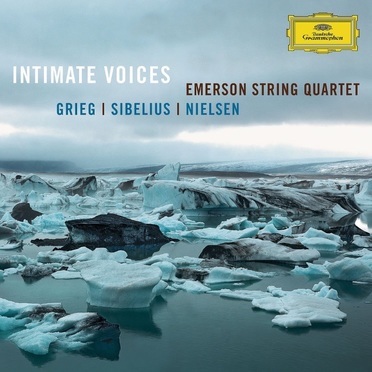 As this 2006 release of quartets by Grieg, Nielsen and Sibelius amply demonstrates, the Emerson's sweet but slightly edgy tone, their flawless but every so slightly impetus ensemble and especially their supple but unbelievably strong sense of rhythm put them in a class above any other American quartet. Some have argued that the Emerson's sympathy for the music they perform is not always beyond question, and this disc -- with its all-too-cool Grief, far-too-calm Nielsen and way-too-nervous Sibelius -- might provide proof for that argument. But it could not be persuasively argued that these are not performances of complete control and consummate mastery; if the Emerson's interpretations are too cool, too calm and too nervous, they surely mean them to be that way. DG's sound is, beyond all argument, as good as it gets in this world: clear and deep and honest and real.